Did a Quince portrait session of Emma at the Old LA Zoo. She was so beautiful and the dress was incredible! For Emma and her Mom it was the 1st time that they ever came here. We had a blast!!! I love this location! There's so many elements that can be used to get some great shots. It makes for a great session. Veronica had an idea of doing like a Cinderella shot with one of Emma's shoes being left on the stairs while she ran up away from it. I figured, OK so I started with metering the scene with a light meter. Then I used a strobe to brighten the shoe. Once we did that we were ready. 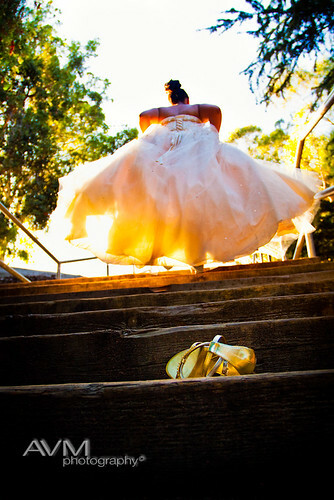 I focused on the shoe and had her run up the stairs a couple of times until I got what I envisioned.